Perhaps, like me, you’re dumfounded in trying to comprehend how others think, what they believe, and why they act they way they do. Throughout the presidential election, and currently, Facebook posts reveal a wide range of emotional outpourings, mostly leaning towards extremes in the socio-political-religious spectrum, left and right. Occasionally, cool-headed “friends” post a more balanced, rational perspective, with pleas for civility and understanding. Some postings provide links to informative articles and books that focus on creating greater understanding of others, especially those who hold opposing worldviews. I’ve read several articles addressing aspects of this issue, but the most comprehensive, intellectually and emotionally satisfying publication I’ve discovered—thanks to my avid book-reading wife, Bettye—is The Righteous Mind | Why Good People are Divided by Politics, by Jonathan Haidt, a social psychologist at the NYU-Stern School of Business. We read a public-library copy, but have ordered two personal copies, one for our home reference library, and one to lend out. Based on years of thorough, rigorous research, Haidt’s findings provide clarity in discerning differences between progressives (liberals, Democrats) and conservatives (evangelicals, Republicans). I think he would agree that most people combine both progressive and conservative qualities, in various degrees and proportions. For instance, although most of my leanings are toward the liberal side, I respect and hold to certain conservative moral tenets. I imagine you do, too. 1) Politicking isn’t about manipulating people who disagree with you, but learning from them. 2) Understanding human behavior requires an understanding of bio-evolutionary origins. 3) Emotions (the elephant) trump reason (the rider), so the best way to influence people is to appeal to their emotions and intuitions. 5) Related conservative themes that carry moral weight are: divinity, community, hierarchy, tradition, sin and degradation. 6) Progressive worldviews focus more on individual needs (individuality), while conservative worldviews are more focused more on group (tribal) needs and/or cosmic order (Creation). 7) Morality is an acquired taste, like food preferences; if it tastes good (and works), it will be accepted (similar to the way people accept religious beliefs and traditions). 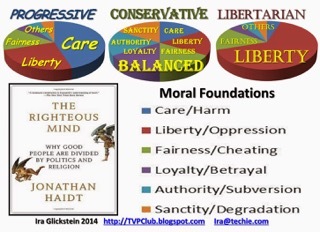 8) While progressives focus mostly on caring for others and fighting oppression, conservatives’ themes encompass faith, patriotism, valor, chastity, law and order, all of which touch on the five moral foundations. 9) Progressives tend to think of themselves as world citizens, while conservatives think more in terms of family, tribe, community, and nation. 10) The left is more yin oriented (feminine nature), while the right is more yang oriented (masculine nature). There isn’t enough space to comment in depth on any of the above, but it seems appropriate to clarify number 3, in which the rider (reason) and the elephant (emotions) are mentioned. Haidt suggests this metaphor as a way of illustrating the enormous role the emotions play in determining all thoughts and actions. The rider serves as the rational partner. For example, when the elephant approaches an obstacle or fork in the road (problem), the rider takes over control, making decisions that keep the elephant on course, and both safe. So, the elephant (body of emotions) makes its way intuitively—until needing guidance (rational rider). This clever metaphor could be helpful in improving self-understanding. Haidt’s ulterior motive is to help create a world in which “fewer people believe that righteous ends justify violent means.” Achieving this noble goal will require people to understand and overcome basic harmful instincts, by developing greater circumspection, reflection and reform. With a new year beginning soon, perhaps now is the time to become more understanding of others—and of our selves. > Resilience: Growthism: Part 2 (Erik Lindberg). Growthism takes growth to be entirely normal and understands it as the very recent triumph of humanity over the awful conditions faced for the first two hundred thousand years of existence. An economy that is not growing is in recession and only “recovers” once it is growing again at an acceptable rate, around 3% per year. Despite all the talk of a knowledge economy or “decoupling,” whether it’s measurable GDP or a higher “standard” of living, economic activity requires raw materials and energy. Hunters and gatherers were not “crippled” by a lack of economic development, or by the absence, even, of electricity. They had everything they wanted and did not want from the lack of unfulfilled wants. This is not to romanticize the past; it is to not romanticize the present. The universe may be infinite but our biosphere is not. Innovation may be able to stretch our biosphere’s carrying capacity, but it cannot breach its limits without dire consequences. > Resource Insights: The Climate Trials Of The 21st Century Have Begun (Kurt Cobb). We now have underway the first climate trials (or various stages of them) of the 21st century. The overall question in these trials is actually straightforward: Do governments and corporations have an obligation to protect the habitability of the Earth’s climate for human populations? Several case trials are coming up, each providing opportunities for airing scientific evidence and expanding existing legal doctrines to cover the unique challenges posed by climate change. If climate change continues at its current accelerating rate, there might be a clamor eventually for the prosecution of prominent climate-change-denying businessmen and politicians. > Resilience: Towards The Tipping Point: Understanding Trump In A Larger Historical Context (Jeremy Lent). Complex systems exist everywhere in the natural world: in weather patterns, lakes, and forest ecologies; within humans (body systems); and they exist in the systems we humans create (markets, social and political systems). A crucial principle is that occasionally a system becomes so unstable that it experiences a tipping point, with a dramatic shift that transforms the system into something very different—a denuded forest turned into scrubland, an overheated real estate market suddenly collapses, or a person’s destabilized neurological firing suddenly causes an epileptic seizure. One important indicator is an increase in the variance of fluctuations within the system. When these findings are applied to history, it’s easy to see turbulent fluctuations preceding phase transitions—in retrospect, like the Great Depression. There is a real threat that we’ll see the end of democracy in this country. An even grimmer possibility is the total collapse of civilization—unless good people take action. > Post Carbon Institute: 2016 Shale Gas Reality Check (David Hughes). In 2014, Earth Scientist David Hughes took a hard look at the U.S. Energy Information Administration’s existing Annual Energy Outlook for shale gas and tight oil forecasts, and conducted his own play-by-play, in-depth analysis to create the groundbreaking report, Drilling Deeper. As in the follow-up report 2015 Shale Gas Reality Check, he found that EIA projections for shale gas production and prices were consistently and greatly overstated. The findings in this year’s analysis are consistent with previous assessments of the EIA’s shale gas projections–they trend toward a very high optimism bias, with increasingly unexplained volatility. The EIA’s yearly AEO has enormous influence with policymakers, the media, and through them the general public, with influences on government policy and industry investment. Hughes’ findings point to increasingly over-stated, troubling forecasts by the EIA, and also increasingly volatile assessments. > Post Carbon Institute: IIn Conversation: Our Economy After Fossil Fuels (Asher Miller, Rob Dietz, Joshua Farley, Richard Heinberg; podcast/transcript). All economic activity entails energy usage. As our energy sources change, our economy will likely evolve and adapt—perhaps in surprising ways. The transition to 100% renewable energy raises profound questions for the future of our economy, including: 1) Can capitalism as we know it survive in the era of climate change and energy transition? 2) What do you think it would take to ensure a just and relatively smooth economic transition? 3) What economies appear to be adapting best to our climate and energy challenges? 4) What practical/concrete things can listeners do—particularly in the current economic and political climate—to support the transition to a sustainable economy? > Local Futures: Beyond Trump: The Path To Real Change (Helena Norberg-Hodge, Richard Heinberg; webinar/transcript). This webinar serves as a hopeful antidote to the paralysis felt by many following the election of Donald Trump as the 45th US President. In it, we go beyond the minutiae of the election campaign and explore the bigger picture, including: 1) The increasingly corporatized and globalized economic system which has led to the rise of Donald Trump and counterparts in Europe; 2) The implications of Trump’s election for the international movement for trade justice, climate action, human rights, and localization; 3) Why it’s important to differentiate between progressive resistance to free trade and the authoritarian nationalism of Trump; and 4) Most importantly, where we can go from here and how we can move forward with an agenda for positive systemic change. > Cassandra Legacy: There Is Only One Culture: Bringing Back Science Into The Fold Of Humanism (Hugo Bardi). The prevailing public concept of science and literature as two separate cultures has created misunderstandings and conflicting views. There is really no reason for considering modern science a separate culture rather than part of the human culture that we call humanism. Science is the basis for creating things, which we may translate as “craftsmanship” and that originates the modern term “technology”. Here lies the problem, a great wave of optimism that science and technology can bring us a new age of happiness and prosperity. In order to solve our problems, we need more gadgets, which requires more science education. We have too many gadgets, not too few. Technology is bad in itself, but this fascination with gadgetry is generating multiple disasters, from climate change to all the rest. Someone who loves knowledge is a philosopher and that’s what we should be; because it is our call as human beings. > Inside Climate News: On Climate Change, Obama Lays Down A Scientific Gauntlet For Trump Administration (John H. Cushman, Jr.) The Obama Administration released an updated compendium of the accepted science about global warming that’s intended to guide the preparation of the government’s next National Climate Assessment, a periodic comprehensive report scheduled to be released in in 2018. With the entire Obama climate agenda expected to come under assault by the Donald Trump regime, this report, released in draft form for comment by experts, lays down a marker for the climate consensus. It may well become a benchmark against which the next administration will be measured. At the most basic level, the report speaks bluntly of the core understanding of climate science that is accepted by essentially every authoritative institution, yet remains anathema to some politicians. In short, the report states that the worst effects already being felt will become the new normal before long. > Huffington Post: This Year’s Extreme Weather Was One For The Books (Lydia O’Conner). 2016 has been scorching hot, freezing cold, soaking wet and consumed in flames―and it’s just a sneak peek of what’s to come if we don’t change our course on energy. Some of climate change’s more dire potential effects haven’t happened yet, but more intense and more frequent extreme weather is a consequence we’re experiencing right now. Some of the biggest climate events the U.S. experienced in 2016 include: 1) A January blizzard that set multiple snowfall records in the East, covering about 434,000 square miles in 26 states; 2) Summer 2016 saw not one, but three “1-in-1,000-year floods”; 3) In October Hurricane Matthew shattered records as one of the longest-lasting, strongest hurricanes of its kind; 4) 2016 is poised to be the hottest year on record, with sweltering heat waves throughout the summer; and 5) Ongoing drought and high temperatures primed western forests for massive wildfires. > The Guardian: Smog Refugees Flee Chinese Cities As ‘Airpocalypse’ Blights Half A Billion (Tom Phillips). Huge swaths of north and central China have been living under a pollution “red alert” since last Friday when a dangerous cocktail of pollutants transformed the skies into a yellow and charcoal-tinted haze. Greenpeace the calamity had affected a population equivalent to those of the United States, Canada and Mexico combined with some 460m people having to breathe either hazardous pollution or heavy levels of smog in recent days. According to reports in the Chinese media, flights to some pollution-free regions have been packed as a result of the smog. The China Daily reported that smog had paralyzed airports in Beijing and across the country’s northern industrial heartland in cities such as Tianjin and Shijiazhuang, making escape impossible. 150,000 Chinese are escaping by traveling to safe havens. > Inequality: A Tale Of Two Retirements (Staff). A new Institute for Policy Studies report shows that the real retirement security divide is between those at the top of corporate America and nearly all the rest of us. We found that just 100 corporate leaders have company retirement funds worth $4.7 billion—a sum equal to the entire retirement savings of the 41 percent of U.S. families with the smallest nest eggs. For decades, big-company CEOs have been cutting traditional employee pensions, the type that guarantee a monthly check after retirement. Moreover, they’ve been eliminating retirement benefits altogether or introducing 401(k) plans that shift the investment risk onto their employees. According to the Economic Policy Institute, nearly 40 percent of workers approaching retirement age have no such plan, and will likely depend entirely on Social Security. One fair way to help pay for this expansion is to demand that CEOs and other wealthy Americans contribute to Social Security on their total earned income, as almost all other workers already do. > The Conversation: The Global Road-Building Explosion Is Shattering Nature (Bill Laurence). A new study suggests that the worst human threat to nature road building, with around 25 million kilometres of new paved roads expected by 2050. Roads have already sliced and diced Earth’s ecosystems into some 600,000 pieces, with more than half less than 1 square kilometer in size. Only 7% of the fragments are more than 100 square km. Roads often promote illegal deforestation, fires, mining, hunting and road-kill. Keeping track of roads is a very difficult task, particularly in developing nations, where most of the planet’s critical tropical and subtropical forests exist. Around 90% of all new roads are being built in developing countries, and much is poorly planned or chaotic, leading to severe environmental damage. One way we’ve tried to promote a win-win approach is via a global road-mapping strategy that attempts to tell us where we should and shouldn’t build roads. > Common Dreams: Trump’s Election Has Led To Massive Wave Of Donations To Progressive Groups (Nadia Prupis). In the wake of the election that vindicated Donald Trump’s campaign, many Americans are turning their despair into action, supporting a range of organizations that fight for equality and civil rights. For examples, Planned Parenthood, which has quickly become a target of the newly emboldened Republican party, has received more than 300,000 donations since , which is 40 times higher than its normal rate, and about 82,000 of those were given on behalf of notoriously anti-choice Vice President-elect Mike Pence. Also, the American Civil Liberties Union (ACLU) got such a high influx of contributions that its donation page crashed. Since the election, the group has raised more than $23 million. Even smaller organizations have prospered. > Yes! Magazine: How To Face A Trump Presidency: Resist, Reconnect, Renew (Sarah van Gelder). What are we to do as we face Inauguration Day and day after day of a Trump presidency? First, remember that the president-elect lost the popular vote to Hillary Clinton by 2.8 million votes, so he has no mandate from the people to pursue many of his avowed goals. Our first task, then, is to get ready to resist in ways small and quiet, and large and loud. To make it through, we need to reach out and connect with people who are supportive, and also to those who are most vulnerable. Finally, renew commitments for active participation in grassroots movements, especially on local community levels—neighborhoods, cities, and statewide. We can build democracy, inclusion, love, new sources of energy, and locally rooted economies. > DeSmog Blog: How to Convince Your Neighbors Climate Change Is Real? Stop Calling Them Idiots, Says DeSmog Founder Jim Hogan (Ashley Braun). As Jim Hoggan told an audience of earth and climate scientists at the American Geophysical Union conference recently, “These campaigns are not so much about persuasion as they are about polarization, about dividing us.” When he first founded DeSmog in 2005, Hoggan learned that the reason people denied the legitimacy of climate science was because of disinformation, not misinformation. While writing his book, I’m Right and You’re an Idiot, Hogan realized that the strategy of those putting out anti-science propaganda is to pollute the public discourse, which they accomplish by arguing that there are no clear facts and no objectivity, just intentional manipulation. These kinds of divisive tactics move Americans into so-called “tribes” with others like themselves, but it’s possible to listen, learn, and share common concerns and values. > Solutions Journalism Network: The Best Solutions Journalism Of 2016 (Elizabeth Tompkins). SJN celebrated its third birthday this year. We’ve trained dozens of news outlets across the country, and increasingly, we’re seeing the solutions journalism approach spread overseas to the BBC and beyond. Thousands of journalists have taken our workshop or used our toolkits, and our new Solutions Story Tracker recently surpassed 1,500 stories, with hundreds more that have crossed our radar but not been captured yet. In 2016 — with partners like the PBS NewsHour, Ms., Detroit Free Press, Minneapolis Star Tribune, Baltimore Sun, WNYC, and our “Small Towns, Big Change” partner newsrooms in the mountain West, not to mention over 2,000 members in our online Hub Hub— we’re seeing it becoming mainstream. Below are our top picks for this year: 12 beautifully crafted solutions journalism pieces on how people around the world are responding to social problems. > Political Critique: All Money Should Be Used For Public Good (Marcia Gerwin, with author-activist Christian Felber). The Common Good Balance Sheet is a tool to measure the degree to which the company adheres to the fundamental values of democratic society. These are usually anchored in the Constitution: solidarity, justice, sustainability, democracy and dignity. In a Common Good Balance Sheet every stakeholder evaluates the company based on these principles. We also measure the dignity with which the company treats its suppliers, investors, employees, clients, future generations, the broader community and the planet. This instrument already exists. So far it has been implemented in around 400 companies on a voluntary basis. Economy should be about the well being of all human beings and all living beings, including nature. Its success is not measured in financial returns, profits or GDP growth, but in the investments the companies contribute towards the common good. > Michael Moore: Where To Invade Next, Trailer “The American Dream” is alive elsewhere, and needs to be imported back. Countries visited and lessons learned.